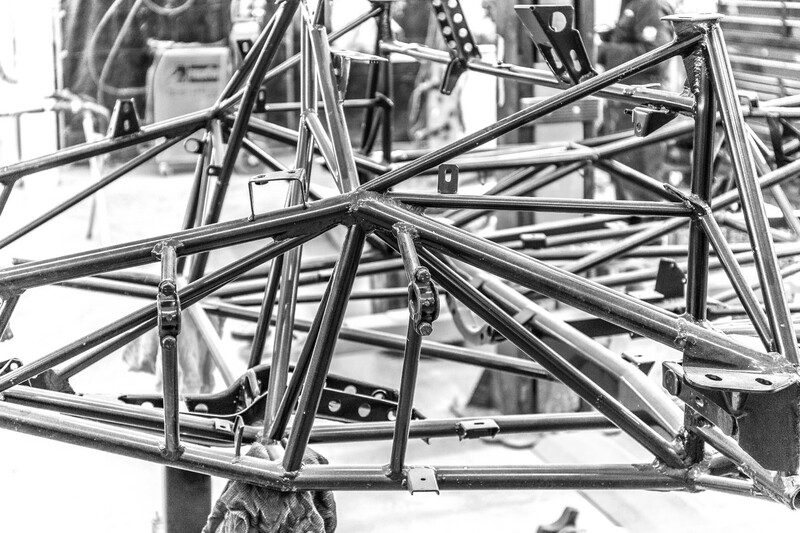 In January the metal team replaced a couple of steel tubes on the 300 SL Roadster Space Frame. This work was completed after extensive measurements were made to ensure the frame remained true. Surprisingly there was very little straightening required for the vehicle which had obviously been handled with care since new. The Space Frame was then sent for stripping and preparation for powder coating. Powder coating is ideal for the rigours of the road as it provides a thicker, durable and more even finish compared to conventional paint. Powder coating is a polymer was developed as an alternative to traditional solvent-based paint. It is applied electrostatically then cured under heat to form a skin. Because powder coating does not have a liquid carrier, it can produce thicker coatings than conventional liquid coatings without running or sagging. Coincidentally, powder coating was invented in Germany around the time the race car version of the 300 SL was competing in the Mille Miglia and Le Mans in the early 1950's. The powder coating process was not ready for production usage until the mid 1960's however, long after the Mercedes-Benz Gullwing and Roadsters had completed production. Now restored with a protective coating that will defend the Space Frame from the ravages of time, the foundation for this 300 SL Roadster is better than new.